Neko Jump Visits Japan and Records A New Song There Too! Neko Jump, a duo we told you about not too long ago, is sure taking Japan by storm! This Thai Pop Duo (stage names Noie and Jaem) are becoming very known through the country for their music, moe (charm), and their cutesy idol clothing! They have even been named special ambassadors of Japanese Pop Culture in Thailand! On November 10th, they visited Japan for the fifth time to record a new song for Kiruminzoo, and met with some members of the press after performing at a fashion event. They had always had a dream to make J-pop, and are huge fans of Ayumi Hamasaki and Yuna Ito. And of course, they have been in love with anime since they first saw Sailor Moon when they were very young! On a side note, we’ve also learned that their father works for TIGA Co. which held a lot of anime copyrights – probably where they got their love of anime from! They also said they like Japan more than their native Thailand because the weather is a lot nicer (it’s always too hot at home)! They want to visit in the spring and see the sakura (cherry) blossoms, and also see what real snow is like too! Their song “Pu” which is used as the show’s opening is a cute song about dreaming of crabs and then not meeting their soul mate. If they dream of a snake they will meet a man! It is based on a very old Thai myth. The ending theme “Chuai Mad Noi” did not translate well into Japanese. The song is a love song, but some how that ends up being “Don’t touch” in Japanese. It was retitled to something happier – “Ohayo Goza-Imaszu”(Formal way of saying Hello). They found this a little strange! When asked what the secret of their happiness was, they said to eat lots of fresh fruits like strawberries! These girls will turn 20 on December 10th. We find these idols incredibly cute and good-natured, and are once again happy to read a story of where people’s love of Sailor Moon has taken them in their lives! 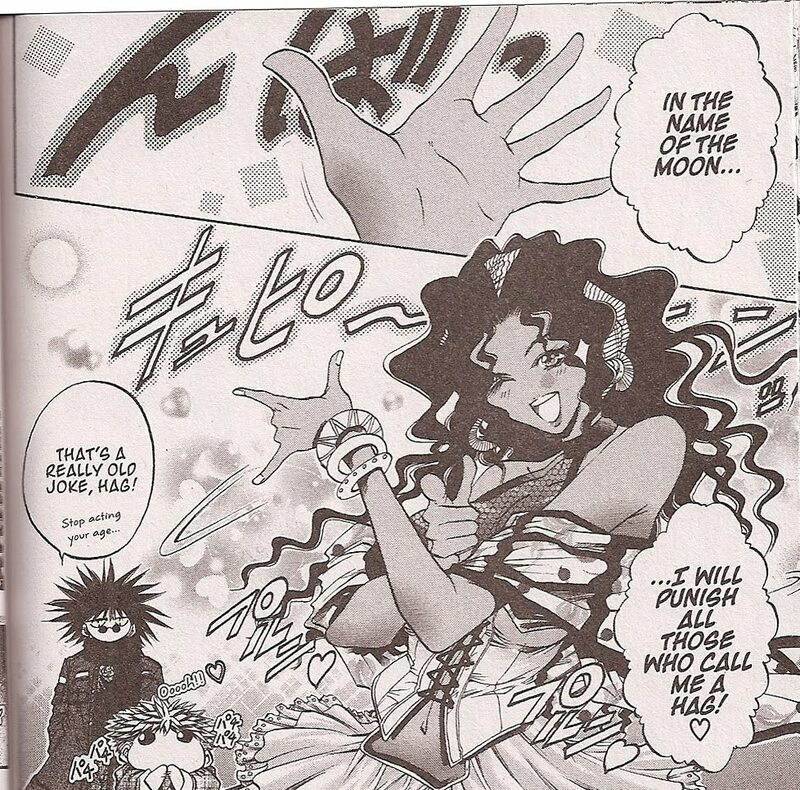 A very long time ago, a fan sent us a Sailor Moon sighting in Getbackers Volume 27, however it was in the French version of the manga and it had yet to be translated in English. Not being familiar with the series, it wasn’t until a long time after that we found out that the volume was part of the Infinity Fortress series, and then things with the site got extremely busy to the point that this poor sighting got put on the back burner, several times over. For this, we sincerely apologize to Boyce for how long it took us to get to this sighting. But, we finally got it! This issue had a couple Sailor Moon sightings in it. The first story in the issue features the Getbackers on an unusual assignment: to recover a lost dog named Lucky. 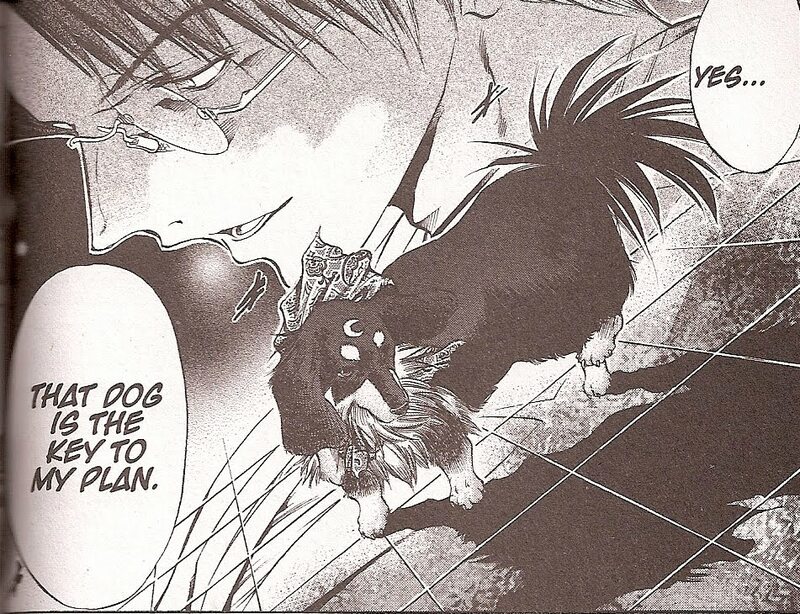 This is part of the Birth 2: Operation: Retrieve the Genius Dog arc! Lucky was taken away by some TV network executives and featured on many shows, but unfortunately when his owner, 15-year-old Natsumi Mizuki wanted him back, they refused to give him back to her. Lucky is a dog that has a crescent moon on his head, and is very good at math. However, the dog has more than just skin and bones under his fur! He reminded us of the cats in the series! Maria : “In the name of the Moon, I’ll punish you! <3"
And here is the sighting in English! 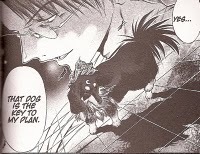 This is included in Tokyopop’s release of GetBackers: Infinity Fortress Volume #2. Tokyopop has lost the license to GetBackers as it was a Kodansha title, however some copies are still available for purchase in stores. The license was pulled mid-release, and this is a title we expect Kodansha USA to announce a release for soon! Neko Jump – First Inspired by Anime, Now Sings Theme Song! 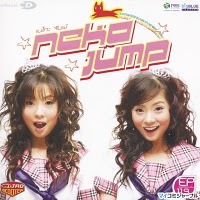 Neko Jump is a very popular J-Pop inspired duo from Thailand. The twins, Warattha and Charattha Imraphon, are currently singing the theme song for the anime Animal Detectives Kirumin (or better known as Kiruminzoo) which premiered on October 5th. The girls have been interested in Japan for almost their whole lives, since their dad used to buy them anime when they were younger. Sailor Moon was one of their favorites! One of their biggest hits, “Pooh” is being used as the theme song for the anime, and is one of the few anime that has a theme song sung entirely in Thai! It’s a very cutesy sounding song and we think it was a perfect choice for the anime! Moonies can check out the opening here! Another one of their hits, “Chuai Mad No” also serves as the series’ ending. While everyone knows major companies like Disney, Fox, Miramax, et al. commit a good portion of their animation work to be done by countries overseas, you almost never hear of animated films from those countries in North America. As we were making our weekly news run this week, we came across a story from Thailand that caught our attention in more ways than one. In the interest of preserving this article as it looks like it will be taken down in a few days, we are going to paste it after this article. We’re not going to clog up the front page, so if you’d like to read it, click the permalink or the link at the end of this article to read it. The Life Of Buddha is a 100 minute animated film that stays true to the Tipitaka, the Holy Scriptures of Theravada Buddhism. The film shows the life of the Lord Buddha from His birth as Siddhartha Gautama, to enlightenment, to pilgrimages, and to his passing to nirvana. The film actually has some interesting history behind itself. It is produced by a Thai businesswoman named Wallapa Phimtong. It started out as a personal project for her in 2004. The film was constantly delayed due to funding issues, and Wallapa sold many of her assets including cars and her own home to finance this 108 million Baht (3.4 million USD) film. We’ve seen some stills and though the style is definitely distinct from Anime, we really think this traditional animated film is worth seeing. The film was made with the purpose of making this Legend more accessible to children. And since Buddhism’s popularity is rising in the west, it will be dubbed into at least five languages. Moreover, this is a gift to the current reigning monarch King Bhumibol’s 80th Birthday and will be released on the special day, December 5th. What surprised us to read this was the fact that this is Thailand’s second cel-shaded animated film EVER! The first one was 1979’s The Adventure of Sudsakorn which was directed by Payut Ngaokrachang. Thailand had its first foray into computer animation with 2006’s Khan Kluay and looks so incredibly cute! And finally, the other shocking thing that we read was that an animator who had worked for many years on many Toei Productions such as Galaxy Express 999, Saint Seiya, and Sailor Moon worked on this movie and had the following to say about Thai animators. “Thai cartoonists and animators excel at such work and are among the first choices for foreign animation companies.” This was something that we at least (and probably most of you) probably didn’t know about as it’s probably a known assumption that since all anime is animated in Japan, the animators are usually hired locally. All of Sailor Moon was inked and painted in Thailand, whereas all the directors, layout artists, and timers were in Japan. This film is currently looking for a distribution deal in Los Angeles, and we will keep you posted once we hear news about it. Fans can watch a trailer here, but be warned. The 8mb WMV downloads at a snail’s pace so you may have to wait a few hours before you can actually watch the trailer. At his birth, Prince Siddhartha was able to walk on magic lotus flowers. The prince grew up in a big, beautiful city, surrounded with luxuries. 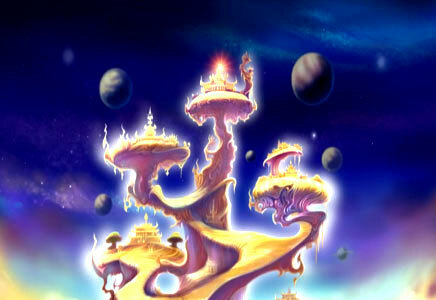 Married with one son, he started to question the meaning of life before fleeing the palace to find the ultimate truth. During the moments leading to his enlightenment, the prince sat under a tree, facing an army of devils in various manifestations, attempting to seduce and distract him from his spiritual goals. These scenes are from a new animation film, Life of the Buddha, to be screened across the country on December 5 to celebrate His Majesty the King’s 80th birthday. While certain scenes, such as walking on lotus flowers, may be questioned by modern minds, the animation project’s president, Wallapa Pimtong, said the story is true to the Tipitaka and the Buddhist canon. 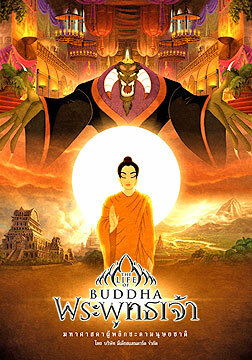 The cartoon runs for 100 minutes, and depicts the life of the Lord Buddha from his birth, ordination, enlightenment and pilgrimages to his passing to nirvana. It will be dubbed into at least five languages – English, Mandarin, Korean, Japanese and German. The 108 million baht project, mostly funded by Wallapa’s Media Standard Company, was started in late 2003 by the firm and the Dharma Cartoon Group, with advice from Mahachulalongkornrajavidyalaya University. According to Wallapa, the only sponsorship the project has received is in the form of public relations support from six state agencies and financial support to the tune of five million baht from the Young Buddhists’ Association of Thailand. The company is also hoping the film will be broadcast as a series on Channel 7. Hoping to distribute the cartoon in the West, where interest in Buddhism is on the rise, Wallapa said they were seeking a distribution deal in Los Angeles. The project, she said, had its fair share of obstacles. After almost two years in pre-production, for example, the team had to revise the screenplay when it was found that certain segments were not true to the Tipitaka. For example, the old script said that Mara dwells in a cave, but Mara is described in the Tipitaka as living in the top level of heaven, called Poranimmittavatsavati. To prevent similar mistakes, the whole script has been reviewed by experts at Mahachulalongkorn- rajavidyalaya University, said Wallapa. According to her, this is Thailand’s first full-length animated movie since Sudsakorn, produced by Payut Ngao-krajang in 1979. The team making the movie consisted of some 50 to 60 cartoonists and animators, many with over 10 years of experience in Hollywood and foreign animation companies. Anusorn Rodsook, an experienced animator who had been part of Toei Animation’s production of Galaxy Express, Saint Seiya and Sailor Moon, said Thai cartoonists and animators excel at such work and are among the first choices for foreign animation companies. Wallapa added that difficulties for this production involved not only the creation of characters, scenes and movements, but also the need to ensure the reliability of geographical facts that required analysis of every scene by experts. Fortunately, there was no need for the production team to survey locations in India and Nepal themselves – they could check photos, provided by Wallapa, who studied at Magadh University, India. “The entire movie consists of over one million drawings. Each minute on the screen took months of production. There was a lot to do, from scriptwriting, storyboarding, layouts, characterisation and background animation to computerisation,” she said. To ensure the contents were correct, a special committee of experts and monks, appointed by Mahachulalongkornrajavidyalaya University president Phra Dhammakosajarn, held monthly meetings. “The monks, especially committee chairman Phra Sudhivoryarn and deputy chairman Phra Srithawatmaythee, would check everything, from the screenplay to characters and movements. Everything had to be approved by them,” Wallapa recalled. According to her, the screenplay, written by Ampira Wongdhamma, begins when a deity is born as the prince who will become the Lord Buddha. It also depicts miracles described in the Tipitaka. Audiences, she said, will be treated to dazzling scenes of miracles, such as when the Three Worlds reveal themselves when the Lord Buddha descends from heaven to visit his mother, Queen Sirimahamaya. In this film, the Lord Buddha’s sayings are direct quotes from the Buddhist canon while conversations have been simplified. To make it easier for children to understand the Lord Buddha’s battles with the Devil (evils and lusts) in his mind, Mara is portrayed in this film as a frightening character. Fun scenes have been included after serious scenes to give younger viewers a break. One example is the Indian-style dancing scene, where Sujata and other women are preparing a special meal (called Khao Mathupayas) for the Lord Buddha, before his enlightenment. One of the themes in the movie is the law of karma. For example, Phra Devadatta, a Buddhist monk who had plotted to disunite the Sangha community and kill the Lord Buddha several times, finally dies. This law is inevitable even for arahants, or enlightened ones. For example, Phra Moggallana, one of the Lord Buddha’s closest disciples, faces a violent death despite his arahantship because he had killed his parents in a previous life. “Although every detail is according to the Tipitaka, the characters are portrayed as human, with joys, disappointments and sorrows,” Wallapa said. For director Assoc Prof Dr Krismant Whattananarong, this is a great challenge. For example, portraying Phra Moggallana as strong and muscular, and Phra Sariputra as physically weak, does not come out thin air. It comes from the Buddhist canon. The banks of the Anoma River, where Prince Siddhartha left the secular world, is also a white sandy beach, not rocky. The tree under which the Lord Buddha lay before passing to parinirvana, is tall and slim, not full of branches and leaves. “We are confident that every detail is true to the Tipitaka. So, teachers can use this animation as a teaching tool,” he said. One of the people waiting anxiously for the completion of this animation is Phra Sudhivoryarn, chairman of the content review committee. “It will certainly help make the Lord Buddha’s life more accessible to children,” he said. Those wishing to support this film may donate 1,500 baht to buy a copy of a book entitled ‘The Making of the Life of Buddha’ for a needy school of their choice. The book is illustrated with scenes from the cartoon as well as providing readers with cartoon drawing techniques. For more information, call 02-556-1366/7 or email wallapa28@ yahoo.com.